Our 20 lb poly woven bag of Enriched White Long Grain Rice protects its contents from the outside environment while at the same time allowing the rice to "breathe". This keeps the delicious rice inside the bag fresher for longer periods of time. 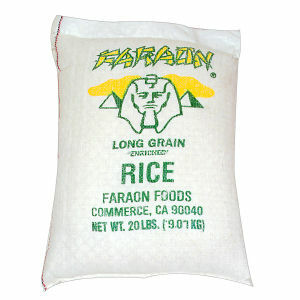 Faraon uses only the very best available rice that come from rice paddies that are irrigated mostly in areas with heavy rain falls.